Welcome to the only newly renovated Crowne Plaza in Tulsa! Our newly renovated Crowne Plaza sits directly across from Oral Roberts University (ORU). We offer excellent access to the BOK Center, the Oklahoma Aquarium, Tulsa Hills Shopping Center, Woodland Hills Mall, RiverSpirit Casino, CityPlex, Oklahoma Surgical Hospital, St. Francis Hospital and St. John Hospital . Crowne Plaza Tulsa offers complimentary hotel shuttle service to and from Tulsa International Airport (TUL) by request. For our business travelers, this South Tulsa hotel is located close to Honeywell Callidus, InterChem, Lynnco Supply Chain Solutions and EnGlobal. Sports enthusiast will appreciate the Crowne Plaza convenient location to the RiverParks running trails, Turkey Mountain, Jenks Aquatic Center, Indian Springs soccer Complex, and Southern Hills Country Club championship golf course. This Crowne Plaza is easily accessible to Philbrook and Gilcrease Museums, University of Tulsa, Tulsa Convention Center, BOK Center & Tulsa Expo Square & Fairgrounds. Host your next business meeting at the Crowne Plaza Tulsa Southern Hills with more than 14,000 sq ft of function space. For the business traveler, this Tulsa Hotel offers complimentary wireless and wired Internet in both guest rooms and public space. 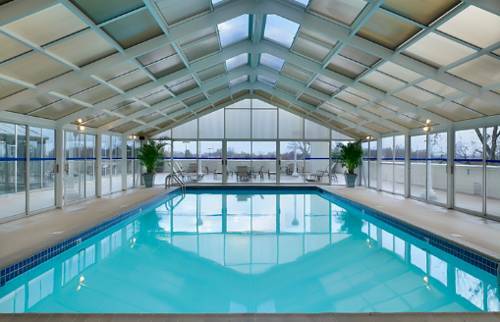 Families will enjoy our year round, indoor and outdoor swimming pool and Fitness Center. Re Vive Restaurant & Lounge: Re Vive Restaurant & Lounge located on the main lobby level. Full bar and menu available. Oklahoma Ballroom: Oklahoma Ballroom located off the main level lobby, features 3564 square feet of flexible event space. From a business meeting to wedding reception this ballroom provides the perfect backdrop for your event! Tulsa Ballroom: A smaller intimate Ballroom located on the first floor of the hotel. Accomodates 275 for theater seating, 200 for a banquet, and up to 120 for a class room style setting. Tulsa Hills ShoppingConvenient Shops All in One Location! There s no better way to maximize your every moment. Tulsa Hills Shopping Center has the perfect blend of retailers to allow you one stop shopping saving you time and money! Lafortune Park Golf CourseThis course offers a 18-hole Championshsip layout, lighted par-3 course and driving range. Since 1960 it's been a shining example of Tulsa golf. Renovations to its traditional layout by Randy Heckenkemper have brought new life to our facility. Andy B's Bowling & Laser TagBowling and entertainment center with traditional lanes, upscale VIB lanes, go-karts and party facilities.